When it comes to getting rid of calluses, any old product will do. However, when it comes to removing calluses and remaining comfortable while doing so, things get a little more tricky. As such, it helps to take the time to ensure you’re getting the best possible callus remover you can get your hands on. The following review will offer three great examples of the best callus removers out there. We’ll also look at how to find the best callus remover if you decide to do some shopping on your own. Although each of the below products certainly perform amazingly when stacked up to the rest of the products within their sector of the market, it’s important that you choose the right one to meet your own specific needs. For example, if the most important thing to you is a high level of control which allows you to tackle the job as you see fit, the Microplane Colossal Pedicure Rasp is your best choice by far. If; however, you’d like to go with an electric model, either of the other two listed models are great. Outside of being electric, the Naturalico lies on the exact opposite side of the spectrum as the Microplane, being that it sacrifices a large level of control in favor of giving you a consistent end result after each and every use. If you can’t decide between the two models, or would like a bit more control in your callus remover while still walking away with an electric model, the Amopé Pedi Perfect should prove to be a great choice, being that it maintains its electric status without giving up too much in the way of control when compared to other electric models. The Amopé Pedi Perfect Foot File belongs to a category of products known as electric callus removers. 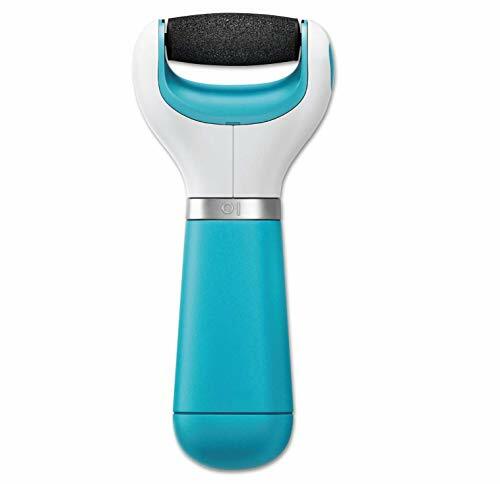 Not only does this type of callus remover already excel over the vast majority of other types of callus removers, this particular product is also one of the best in its category. The first thing you’ll notice upon looking at the product in question is that, as far as callus removers go, it is far from being lightweight in stature. The Amopé Pedi Perfect Foot File comes with a very comfortable handle, allowing you to get a great grip on it from the start. And, because it is battery operated, you won’t find it at all difficult to get the job done seamlessly and in a small amount of time. These two factors alone make it one of the more convenient products of its type. What truly makes the product great; however, is the material on its head. Simply put, you’ll find it to be rather rough. Now, considering that you don’t want to sit around all day working on your feet, this is actually a rather convenient feature to have. You’ll not only find the Amopé Pedi Perfect Foot File to be easier to use, as is the case with most electric callus removers, but you’ll find it extremely efficient. However, if you’ve never used a very rough electric model such as this before, there may be a bit of a learning curve involved. If the above product’s learning curve has you feeling somewhat nervous over your next purchase, you can always try the Naturalico Callus Remover and Shaver on for size. In a sense, these two products actually operate through completely opposite means. For example, while the Amopé Pedi Perfect Foot File’s head is rather rough, you’ll find the Naturalico’s head to be very smooth in comparison. Also, the Amopé doesn’t operate as fast as the Naturalico. As such, you’ll be able to get the same end result from both products, though each one will take a different path to the same end location. Because of the difference in the way it operates, you should find the Naturalico gives you a more “on-rails” experience in the sense that, because it isn’t as rough, it will be less sensitive to pressure, ensuring your experience isn’t changed too much by pressing too hard on the unit or by not pressing hard enough. On the other hand, this may give a lesser degree of control. However, it is worth noting that this lessened sense of control will be somewhat reversed by the unit’s speed settings, allowing you to choose just how quickly the job gets done. While electric files are certainly the more advanced of the bunch, they are not necessarily the best. If you prefer a more traditional feel about your callus remover and would prefer to go with a manual model, the Microplane Colossal Pedicure Rasp is easily your best bet. It offers a huge degree of quality, reliability and durability through its face being made entirely of metal. In fact, from a distance, you might even mistake it for a cheese grater of sorts. 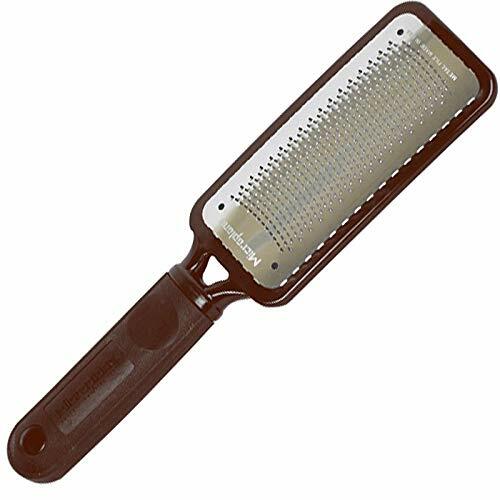 However, it is this uncanny resemblance to a cheese grater that makes the Microplane Colossal Pedicure Rasp so great to begin with. You’ll find this file to be very rough. However, because it is of the manual variety (which offers you the highest amount of control possible), this high level of roughness can truly only be seen as being a good thing. The level of roughness in conjunction with its level of control gives you a huge amount of personalization potential that you just can’t find in most similar products. Whether you like getting the job done quick or would prefer something a bit more mild in nature, you’ll find this file allows you to tackle the job in any way you see fit. Although each of the above products certainly perform amazingly when stacked up to the rest of the products within their sector of the market, it’s important that you choose the right one to meet your own specific needs. For example, if the most important thing to you is a high level of control which allows you to tackle the job as you see fit, the Microplane Colossal Pedicure Rasp is your best choice by far. If; however, you’d like to go with an electric model, either of the other two listed models are great. Of course, while these three callus removers are easily the best when measured by any standard metric of quality, there is bound to be at least some degree of subjectivity when it comes to deciding whether or not any given callus remover is worth your while. Although I certainly can’t tell you which product is best for you when you’re shopping on your own, I can certainly help you figure it out for yourself. When shopping, try keeping some of the following considerations in mind. How often will you be able to clean your callus remover? Sometimes, a hectic, on-the-go lifestyle can make cleaning your callus remover a real inconvenience. Despite this, many of us will simply refuse to use a dirty unit due to sanitary concerns. While you could get more than one unit, a better (and cheaper) alternative would be to get an electric callus remover which comes with multiple roller heads. The same can also be said if you find yourself going through files more quickly than most folks, being that said replacement roller heads will save you both time and money in the long run. While included replacement heads will incur a price mark up to some degree, it will prove less costly in the end than going through multiple manual models. How quick are you willing to go? It doesn’t matter how rough your manual callus remover is (perhaps with the exception of the Microplane covered above), it just won’t be able to remove skin as quickly or efficiently as some of the rougher electric callus removers on the market. And, while rougher files tend to operate slower, this is not always the case. For this reason, you may find certain electric models to be a bit too intense. It’s definitely worth seeing what other people online have to say about any given file regarding its intensity before finalizing a purchase. Unlike manual files, rougher isn’t always better when it comes to electric models. How much speed control do you need? If you’ve never used an electric callus remover before, you might not yet be aware of the different speed settings any unit may have. These can be a huge convenience, especially if you’re new to this type of callus remover and could use some time getting adjusted to it at a lower speed. On the other hand, if speed settings were free, every unit would have them in abundance. As such, you’ll find it to be much more economical to stay away from models with a bunch of different settings, as they will likely incur a large price markup. Whether or not economy is more important than control; however, all comes down to your own priorities and preferences. Will you always have time to charge your electric callus remover? If you decide to go electric, you’ll need to figure out beforehand whether or not you’ll always be in a situation where you can charge your unit. If not, you may want to go with a unit which operates on changeable batteries. While this might sound obvious, you’ll notice after some time that many manufacturers refer to their rechargeable internal battery simply as “a battery.” Check to see whether or not the unit you have your sights set on comes with an AC cord or not. If not, you can bet you’ll need to pick up some AA’s on your way home. As I’m sure you have by now figured out, there are two types of callus removers at your disposal – manual and electric. It can be easy to assume that electric models are inherently better than their manual counterparts. However, this is not necessarily the case. Let’s take a quick look at both types of callus removers so you may decide which is best for you. Manual – The callus remover you grew up with. These have you rapidly bring the file back and forth in a sawing motion. These typically require the most amount of effort. On the other hand, they’ll give you an excellent level of control. And, being that you know your skin better than file manufacturers do, this will likely lead to a more comfortable experience. Electric – The new kid on the block. These offer the most consistent filing experience, being that they remove the possibility of human error; simply press the roller head against your skin and press a button. However, such callus removers won’t offer you any serious degree of control, save for a very small amount of exceptions. As such, if you have sensitive skin or some other limitation which requires you to be extra careful while filing, it may take a while to find the right model for you. Because everyone has their own needs and preferences, only you can decide from the above two types of callus removers. However, there are a few features you may happen to find in callus removers which could be considered as being beneficial on a universal level. It can’t hurt to keep an eye out for them when shopping. A Metal Face – This applies to callus removers of the manual variety. Unlike the sandpaper-esque material found on many files, a metal face will last you a lifetime. Metal also tends to be much more effective. Extra Roller Heads – This one applies to electric callus removers. No matter what, you’re going to need an extra roller head at some point or another. While included roller heads may make a unit somewhat more costly, they will always prove cheaper in the end than buying more heads separately. Outside of making sure your callus remover comes with either a metal face or extra roller heads (depending on the type of remover you end up choosing), picking out the right features in your next unit is all up to you. While certain products (such as the three listed at the beginning of this review) may be of more quality than other units, only you know your skin. Keeping all of the above considerations in mind, finding the right callus remover for your skin should be a very easy ordeal.